Every neighborhood should have an urban farm. That’s a declaration from Erin O’Neill, who oversees the culinary garden at Santa Fe Community College. And if you’ve ever visited that garden, you would clearly see what abundance can occur in a relatively small space. “Our youth want to know how to grow food,” she said in a film that will be screened publicly for the first time Saturday at the Center for Contemporary Arts Cinematheque. The documentary “Bringing Food Home” is the work of filmmakers David Aubrey and Nanda Currant. They started work on it after Gaia Gardens, an urban farm operating along Arroyo Chamiso, attracted a host of city zoning, fire, electrical and more inspectors after a neighbor complained about the operation. Founders Poki Piottin and Dominique Pozo labored to bring it into compliance, losing some of their flexibility to bring in volunteers to help farm and groups to learn how urban farms can work, and to sell produce on the premises. At the same time, a host of neighborhood residents spoke out in favor of Gaia Gardens, saying it was a center to build community, and a welcome oasis in the scrubby and weedy environs along the sandy arroyo. Aubrey said in a telephone interview that he had ridden his bike along the trail behind Gaia Gardens and seen the plantings taking shape there. When he heard about the issues it was having with zoning and city ordinances, he thought it would be ripe for filming. He hadn’t had a particular interest in urban farming before, but has been a filmmaker in Santa Fe for 34 years. Previous work of his includes “A Thousand Voices” about tribal women in the Southwest, which aired on New Mexico PBS and won an award from New Mexico Women in Film, and the Emmy-winning “Canes of Power,” which explores the history of the canes President Abraham Lincoln presented to tribes to signal their sovereignty. Hearing about Gaia Gardens, Aubrey said, he wondered “with all our best intentions, with the interest so broad in eating healthfully, it seems kind of like a no-brainer. Why wouldn’t we love this?” The filmmakers considered broadening the project to a feature-length documentary on urban farming, but the time and money for such a project meant it would not be ready in time to have an impact on the local situation, he said. “It would take a long time to get out the word,” he said. But the film does reach beyond Gaia Gardens in talking about the need for local food sources. And that was one of the points that stood out for me. The more centralized any industry or system becomes, the easier it is to derail. Just think of our worries these days – remember Y2K? – about computer espionage and sabotage, and about what might happen to our banking, defense and a host of other systems if a hostile hacker invaded electronically and wiped out stores of data or took control over them. Focusing on food, have you ever noticed how people rush to the grocery store when there’s a prediction of a major snowstorm, hurricane or – well, if we ever developed a good way to predict earthquakes, them, too. In most cases, it seems a little irrational. But is it really? When we rely on stores for our food that is shipped in from across the nation, and across nations, it’s easy to get a little nervous about shelves becoming empty if our transportation systems suffer a major disruption. And how about the way food is grown on a massive scale? More and more, major growers limit themselves to only a few types of crops. Yet that makes those crops more susceptible to failure if a bug or other pathogen attacks en masse. Just look to the Irish potato famine, which began in 1845, lasted a half-dozen years, and caused the deaths of a million people and the emigration of another million, according to historyplace.com. There were a lot of political factors that greatly increased the misery caused then, but a root factor was that poor peasants began to rely strongly on the potato, and a particular variety of potato at that, when it was hit by a fungal blight. The potatoes died and, without a good supply of other food to rely on, people starved. Variety is good. Local is good. A food supply relying on a bunch of small, local (or at least regional) growers can adapt more quickly to challenges, both in what is grown and where food is sent, say people interviewed in the film. To get there, though, we all have to be adaptable, they said. “Sustainability is going to mean changes. It’s going to mean sacrifice,” said Bianca Sopoci-Belknap, chair of the Sustainable Santa Fe Commission. And it’s going to mean some loosening of some city rules that make urban farming more of a struggle than it needs to be. In his online blog, Piottin has said that he only made $10,000 last year. Many of us would have a hard time surviving on that kind of income. After visiting a small farm on the south side of Santa Fe recently, I felt as if I had been to the ocean. I say this because there, amid oscillating stands of healthy spinach, chard and kale, my senses were saturated with the effervescent sights, sounds and scents of a place teeming with life. Standing beside a kaleidoscopic garden of medicinal plants on a gentle rise in the land while listening to the clatter of ducks, and watching many birds fly overhead, I was aware that my being was being suffused by a benevolent and undeniably tangible cosmic force like the tides of the sea. Gaia Gardens is a varied and lush one-acre project on a three-acre plot on the edge of the Arroyo Chamisos, between Siringo and Zia roads. The spirit behind this wonderful gift to a mostly residential arroyo-side neighborhood is Poki Piottin, a Frenchman with a resolute piercing gaze possessed of the fervent warrior spirit of his Gallic ancestors. That spirit, luckily for us, is directed toward amicable life-engendering gardening. Beside Poki is the gentle, marvelously happy spirit of Dominique Pozo, who lavishes care on the once unremarkable, dry, rocky piece of ground they planted with the help of volunteers. The three-year-old nonprofit initiative is only partially about providing affordable, wholesome food to the community. It is just as much about the nourishment that such a place can provide the minds and souls of people who may not in their day-to-day lives otherwise find such calm and soothing healing effects. “Even though, within the rigidly conceived constructs of our present culture and society, people are not supposed to wander into another person’s ‘private property’ and recharge their spirits courting ducks or running their hands over velvety plants, it is precisely my wish for them to do so,” said Poki, as we sat at a table beneath a tree in the garden’s informal open-air kitchen and enjoyed a glass of fruit juice, fresh radishes and humus on toasted bread. “Sometimes in the midst of a particularly toilsome afternoon, a mother and her children will show up, and while the mom is sitting beneath a tree taking an obvious break from the arduous task of raising children, the children are responding to all the stimulating biological phenomena at their fingertips”. I believe that the common person inwardly yearns to experience the elemental sources of life that were germane to the evolution of all of human culture and which can still be accessed on a small-scale intensive organic farm such as this. Here nothing is wasted and the bounteous yields serve to nourish our bodies, oui, but together with the rich processes inherent in growing food, they supply us with inspiration and energy for things of transcendental importance. The fact that this garden is embedded in the midst of a thriving neighborhood where people can come together around one of the most creative things on Earth should be seen as one of the neighborhood’s most important assets. A garden such as this can function as the perfect catalyst for creating healthier, more integrated and sustainable relationships between people, to say nothing of the relationship between people and the Earth, which is also of vital importance, lest we all float away into cyberspace. By its very nature, the garden integrates plant, mineral and animal life but it also integrates the elderly, children, youth, adults, mothers, fathers and entire families, into a seamless caring community of vibrant, creative and happy human beings. What more do we want? Such spaces are at the very root of Santa Fe’s soul, history and way of doing things. The old Chicano-Mexicano people of this town are quick to tell you that until the 1940’s and 50’s, gardens and cornfields permeated all of their family compounds that comprised the entirety of Garcia, Canyon and many other residential enclaves. Archival photos from that period clearly show that the grounds of the Plaza, the very heart of this world-bedazzling town, was set aside for productive gardening and was tended to by locals. In fact, the religious, cultural and economic underpinnings of the Pueblo world as well as of much of the native Nuevo Mexicano villages that constitute the foundations of our state, arise from the very same or similar set of values and practices being carried out at Gaia Gardens. Can urban farming flourish in the high desert? Growing up in the Candlelight neighborhood of Santa Fe, I often felt like I lived in adobe suburbia. The homes in this wedge just west of the intersection of Zia Road and St. Francis Drive are pretty cookie-cutter, you have to drive everywhere and nearly every property has a perfectly manicured yard full of gravel. So when I visited Gaia Gardens for the first time this summer, I felt like I had been transported into another dimension. The whole setting, from the lush garden beds with over 30 different types of vegetables to the spacious chicken coop where fresh eggs are produced daily, breaks the mold of concrete driveways and xeriscaped landscapes. To get to the farm that’s off Yucca Road along the Arroyo Chamiso Trail, I park on Paseo de los Chamisos and walk through a set of wrought-iron gates adorned with Zia symbols. I am greeted by a long-haired 20-something guy on a bike, who turns out to be a volunteer with Worldwide Opportunities on Organic Farms, an organization that links volunteers with organic farms all over the planet. We walk down the hill toward the gardens where Poki Piottin, the farm’s founder, is organizing deliveries for the day. As we stand under a tree chatting, Dominique Pozo, Piottin’s partner and the farm’s artistic director, walks outside and shouts at us to look up. We lift our heads in time to spot a large gray and white bird perched on a nearby branch. Despite growing up a mile away and attending high school just down the street, I had never seen a hawk here before. For Piottin, this is what it’s all about—getting the community to engage with the environment and its neighbors in a way that doesn’t happen in cities anymore. Proponents of urban farming are offering up a lot of hype, going so far as to tout its potential to rejuvenate depressed neighborhoods in cities like Detroit and Baltimore by developing unused land, addressing food insecurity and promoting healthier diets. I knew nothing about the concept until two years ago, when a friend in Washington DC said he was growing tomatoes on his roof. On Facebook, friends in New York City and San Francisco were posting photos of themselves in overalls with skylines in the background. When I moved back to Santa Fe in June, I was convinced I’d find a plethora of these progressive efforts to build a more sustainable future for food production. I didn’t. One way cities can promote urban farming is by addressing land use laws. Those ordinances are typically broken down into three categories: residential, commercial and industrial. And since urban farms often occur in someone’s backyard, cities are grappling with how to appropriately regulate these new operations given their tendency to blur the lines they’ve drawn over the past half-century. 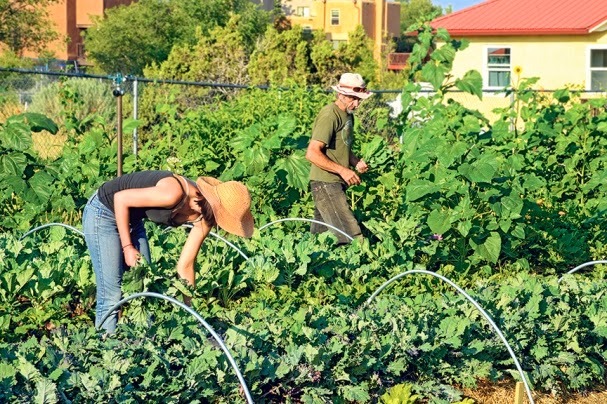 The city of Santa Fe, however, has yet to produce a policy that addresses urban farming. Last summer, the Public Works Committee considered a resolution that ordered city staff to look at ways for urban agriculture to be integrated into land use, but that didn’t get far. Now, the Santa Fe Food Policy Council is preparing what it calls “a comprehensive food plan,” part of which addresses urban agriculture. This fall, those formal recommendations are expected to land before city and county officials. Gaia Gardens is a perfect example of how bumpy the road can be. The farm started in February 2012 shortly after Piottin spent six months working on a farm in San Pancho, Mexico. Piottin has spent the last two years working to develop the farm despite complaints from some neighbors about the frequency of farm visitors. Last summer the city issued citations about code violations on the property and even said school kids could no longer take field trips to work on the farm and volunteers weren’t allowed to sleep in tents there. A farm stand had to be shuttered and the produce couldn’t legally be sold from the site, the city ordered. I knocked on the door of the neighbor who, according to Piottin, takes photos of the garden when too many volunteers are on the field. She told me she was “addressing the issue in other ways” and shut the door. Even if the city adopts a more farm-friendly policy in residential zones, I wonder what we can realistically expect from a region that averages 14.21 inches of rainfall per year and where the cost of water, not to mention land, is so high. Although Gaia Gardens has a permit application with the State Engineer that is under protest and could affect the water part of the equation, much of their overhead costs are uniquely low. Last year, they brought in just over $21,000 from sales. Their total expenses were $16,000, leaving the farm with about $5,000 in net revenue. The slim profit margin, Piottin says, is why it is so important that the city provide support for urban farmers. “There’s a lot of talent and potential here. We may be behind most cities, but we can forget that by creating something that help young urban farmers,” he says. Although Gaia remains the city’s largest commercial farm, there has been a local uptick in the number of residents interested in farming. 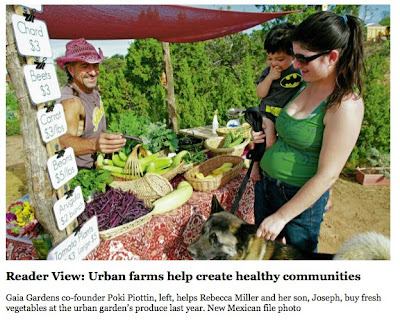 “I would definitely say that in more recent years, urban farming has become a growing trend in Santa Fe, and not in the sense of large commercial farming, but rather a lot of folks just want to grow their own food,” says Patrick Torres, interim Northern District director for the New Mexico State University Cooperative Extension program. Gerard Martinez, who lives in Los Cedros neighborhood near Nava Elementary, began growing food in his backyard five years ago. Today, Martinez says he saves $300 on food costs each year by getting food from his backyard. The biggest challenge, he says, is water. He’s installed an irrigation system that reclaims water used by his dishwasher, but he says if the city is serious about helping urban farmers, it also needs to find residents more access to graywater. So what’s holding urban farming back? It’s impossible to argue that Santa Feans lack the interest or ingenuity to boost local food production and expand access to affordable produce on their own. But residents need clarity as to how the city plans to regulate farms, and they could really use greater access to safe reclaimed water. My childhood neighborhood needed something like Gaia. I’m waiting for the city government to catch up. Conor L Sanchez is a graduate of Santa Fe High and Occidental College who will leave for Nicaragua to serve as a Peace Corps volunteer next month. As a first-time visitor to Santa Fe, where I’ve spent the week training 15 high school teachers for environmental science, I had the great pleasure of visiting the Gaia Gardens organic urban farm. For many years, I’ve heard so many good things about Santa Fe — a national leader in arts and sustainability — and thus was delighted to find this jewel in the heart of your lovely city. During my visit, I learned not only is Gaia Gardens producing high-quality organic products but also has the mission of educating Santa Fe citizens, including students on all levels. I also learned of your “Sustainable Santa Fe Plan,” yet another forward-thinking program that includes “making the community more resilient in the face of climate change” based on the three principles of environmental stewardship, economic health and social justice. Gaia Gardens encompasses your commitment promoting all three of these principles. There is no greater human impact on our biosphere than agriculture, which consumes 40 percent of our planet’s fresh water, 40 percent of its arable land, more than 40 percent of the gross annual biological productivity and a toxic soup of agrichemicals while it emits 18 percent of global greenhouse gases. This is obviously an unsustainable food production system. Thank goodness for Gaia Gardens, which demonstrates another way — highly nutritional, local, organic produce with carbon-neutral input and insignificant water use. If you haven’t visited this remarkable operation, you’re missing a Santa Fe treasure. Thanks to Santa Fe for its foresight in promoting such activities. I will be telling your story to many more as I travel across the nation for my teacher-training activities. Jack Greene is a College Board Advanced Placement environmental science workshop consultant and resides in Logan, Utah. Most city folk have no business wearing a pair of overalls or handling a scythe. But some are anxious to try. As the demand for locally grown food continues to rise nationwide, a few city dwellers are responding by tilling the soil in vacant lots, empty fields, rooftops and other innovative spaces. It’s called urban farming — the growing and harvesting of food in a city that is intended for sale — and it’s taking off, little by little. Some cities have even implemented policies encouraging and subsidizing its growth, helping the movement to reach its full potential. For example, San Francisco is considering tax breaks for property owners who make empty lots available for farming. Detroit has enacted an urban agriculture ordinance law, specifying where farms can operate and under what conditions. Austin, Texas, has adopted a framework that helps farmers connect the dots between various stakeholders. Cities are taking action because they recognize that urban agriculture does more than just produce locally grown, sustainable food. It builds community, improves the environment, beautifies empty lots, increases food security and encourages healthy diets. The verdict is still out on whether the concept has any substantial economic potential, but few can argue its ability to bring people together and to educate them about food production. Despite all this, Santa Fe seems to be on the fence. Gaia Gardens — located across from Santa Fe High along the Arroyo Chamiso Trail — remains one of the few commercial urban farms inside city limits. Since it started in 2012, the organization has repeatedly been cited for various city code violations. At one point last year, the Gaia controversy prompted the city’s Public Works Committee to consider a resolution ordering staff to look at ways urban agriculture can be integrated into land uses. Unfortunately, the resolution has not progressed. Regardless of how the Gaia saga plays out, the city needs to let residents know where it stands. The absence of a concrete, citywide policy sends a message of indifference to would-be urban farmers and their would-be customers. The Santa Fe Food Policy Council has prepared a food plan that covers a range of issues, including urban agriculture. After taking comments from the public, the council will make a recommendation to city and county officials for what is most appropriate for our city, given its unique water needs. Irrigation water rights should be available on some vacant lots, making growing food possible and affordable. Their recommendations are expected to come in early fall. There may not be a magic formula that leads to the successful implementation of urban agricultural initiatives. Cities inevitably have differing approaches, each according to their own needs, desires and politics. But the longer Santa Fe waits to figure out what works best for its population, the longer it postpones reaping the benefits of what is already serving to revitalize hundreds of communities throughout the United States. With food insecurity such a problem in New Mexico, making healthy, fresh food available close to home makes sense. If Santa Fe wants to be a leader in the green economy, we have to dig deeper. Urban Farming-The School of the Future? Wendell Berry, the legendary farmer and poet states: “Our Children no longer learn how to read the great book of Nature from their own direct experience, or how to interact creatively with the seasonal transformations of the planet. They seldom learn where their water comes from or where it goes. We no longer coordinate our human celebration with the great liturgy of the heavens." When my mother took me to my first kindergarten class, I screamed and kicked; I had no desire to go to school. Already I sensed I would be confined and indoctrinated for many years, molded into a good tax-paying citizen. I survived my so-called “education” and became a creative entrepreneur for 25 years until the 1999 World Trade Organization events in Seattle. Profoundly affected by our government’s violent response to civil disobedience, I vowed to become an activist and steward of the Earth. For the past ten years, I have been involved in a variety of projects related to sustainability and, at 52 years of age, became a farmer. I chose to farm within the City to interact with and inspire as many people as possible, believing that lasting ecological health and social well-being are fostered by rekindling our connection to the Earth and reclaiming our food sovereignty. For the past two years, with the help of countless volunteers and school children, we have built Gaia Gardens, a one-acre working farm, using imagination, elbow grease and a wealth of community resources. A farm is much more than a place that grows vegetables. It is a living organism, a sanctuary for wildlife, a business operation, and a micro-community. In order to keep it alive, the people involved must understand not only the world of plants and soil health, but also plumbing, carpentry, electricity, animal husbandry, accounting, public relations, sales, marketing, grassroots community organizing, conflict resolution, and, as we’ve painfully discovered this year, politics. Unlike the sustainable Santa Fe of 1919, when a survey found 1200 acres of farmland irrigated by 38 acequias, modern urban farms must negotiate a maze of city ordinances, building codes, land use and water issues, all in an effort to demonstrate compatibility with the neighboring residential community. In addition to growing food, Gaia Garden’s activities have also included educating school children, working with groups of volunteers, hosting free workshops, and setting up a produce stand. Such activities have conflicted with existing city ordinances regulating a business in a residential neighborhood. 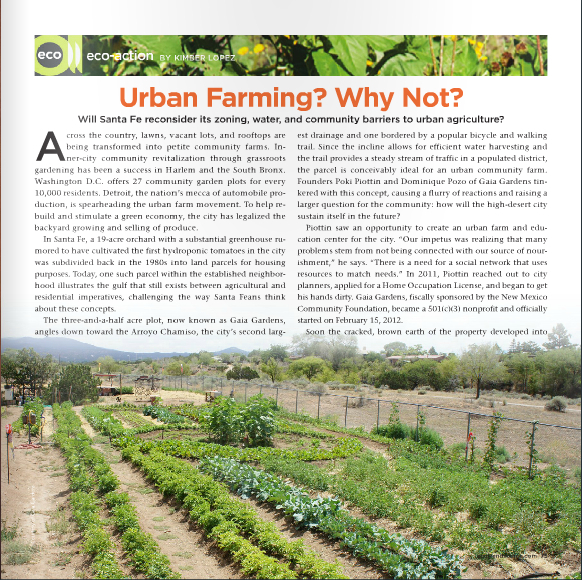 Although these activities fully align with the 2008 Sustainable Santa Fe Plan passed by the City Council, our current city ordinances do not accommodate the reality of urban farming. When I look at Gaia Gardens, I see not only a modern version of a victory garden but a perfect school, all in harmony with a regenerative Santa Fe. Math, physics, ecology, science, construction, economics, art and more are all present in a palpable and real-time form. And best of all, the classroom is outdoors, so a child can BE with Nature, have fun, learn the skills of the future and build a strong and healthy body at the same time. 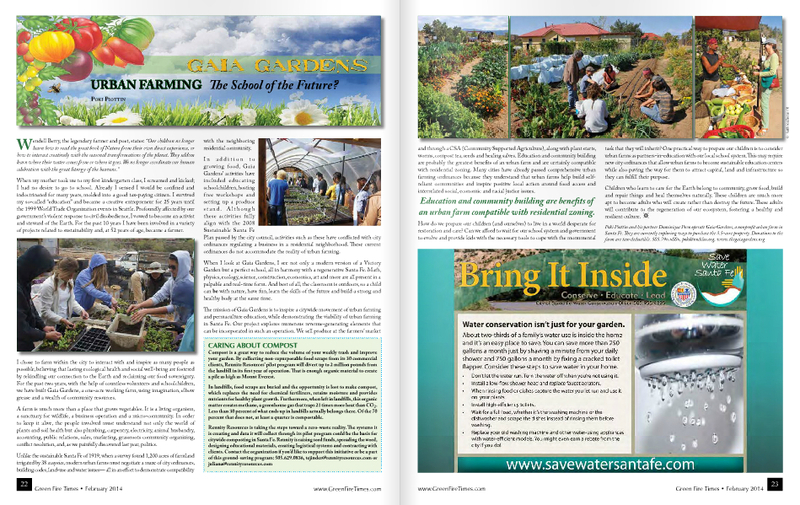 The mission of Gaia Gardens is to inspire a citywide movement of urban farming and permaculture education, while demonstrating the viability of urban farming in Santa Fe. Our project explores numerous revenue-generating elements that can be incorporated in such operation. We sell produce at the Farmers Market and through a CSA (Community Supported Agriculture), along with plant starts, worms, compost tea, seeds and healing salves. Education and community building are probably the greatest benefits of an urban farm and are certainly compatible with residential zoning. Many Cities have already passed comprehensive urban farming ordinances because they understand that urban farms help build self-reliant communities and inspire positive local action around food access and interrelated social, economic, and racial justice issues. How do we prepare ourselves and our children to live in a World desperate for restoration and care? Can we afford to wait for our school system and government to evolve and provide kids with the necessary tools to cope with the monumental task that they will inherit? One practical way to prepare our children is to consider urban farms as partners-in-education with our local school system. This may require new city ordinances that allow urban farms to become sustainable education centers while also paving the way for them to attract capital, land and infrastructure so they can fulfill their purpose. Children who learn to care for the Earth, belong to community, grow food, build and repair things, and heal themselves naturally are much more apt to become adults who will create rather than destroy the future. These adults will contribute to the regeneration of our ecosystem, fostering a healthy and resilient culture. Poki Piottin, together with his partner Dominique Pozo, operates Gaia Gardens (www.thegaiagardens.org) a non-profit urban farm in Santa Fe. They are currently exploring ways to purchase the 3.5-acre property where the farm is located. Poki can be reached at poki@nodilus.org 505-796-6006. Donations to the farm are tax-deductible. As a longtime ecology educator in town, I wondered what all the fuss is about Gaia Gardens, so I rode the bike trail right to the gardens and visited the only educational produce garden in the city. Only one neighbor out of a hundred in the neighborhood has complained about “the activities of the farm being beyond the scope of a home occupation business”; examples cited were using small groups of volunteers to run the farm operation and welcoming a few groups from the neighborhood schools. Why can’t the Gaia Gardens people, who are excellent youth mentors, and whose project is so needed in Santa Fe, work with groups of volunteers and school groups for free? These are vegetable farmers who make $500 per week during the growing season, a far cry from the neighbor’s description of the farm being a “massive commercial operation.” So few people who attempt these types of community gardening projects succeed. The hurdles and challenges are too many. The restrictions imposed by the city already have badly damaged the farm financially. But worse, neighbors, many of them elders and children, have been prevented from gathering and working together as they had done for the past year. It would be a shame to lose these gardens and see its operators relocate to a more urban farm-friendly town. I doubt that anybody will try again having a neighborhood farm school in Santa Fe after this experience. The Gaia Gardens folks are exemplary teachers: kind, disciplined and generous. They did not deserve to be maligned. Their being called “bad neighbors” in the press is a shame when the neighborhood association of 43 homes bordering the farm on two sides has voted in favor of having the farm in the neighborhood. Santa Fe needs to make this excellent educational gardening project possible, or the next generation will not learn this most vital human knowledge which we desperately need for each new generation. Each neighborhood needs a gardens and youth project. Perhaps this can be surmounted with “a little help from our friends” such as the Santa Fe youth and ecology supporting foundations? We are nominating the main gardeners, Poki Piottin and Dominique Pozo, for the next New Mexican “10 Who Made a Difference” award and as Santa Fe Living Treasures. I encourage all the city councilors to visit this unique urban farm, as Ron Trujillo and Peter Ives have already done. I hope the Gaia Gardens folks will be able to persevere and get past the hurdles, and that people realize the great gift this farm gives Santa Fe. These are the folks that we need involved in the new Arroyo de los Chamisos watershed enhancement the city is about to embark on. If you read their blog at http://gaiagardens.blogspot.com I believe you will see the truth of the situation. Please, wise citizens of Santa Fe, help save Gaia Gardens. They need and deserve to be championed. Chris Wells is director of the All Species Project’s “Healing human relationship to the Earth, elements and species through cultural arts and applied ecology.” He has been the recipient of The Santa Fe New Mexican “10 who made a Difference” award, as well as the Roger Tory Petersen Award for excellence in ecological education. Operators of an urban farm in Santa Fe’s Bellemah neighborhood are still negotiating with the city about how they can continue to legally grow vegetables. Meanwhile, city councilors are weighing a resolution that would order staff to look for ways urban agriculture can be integrated into land uses in the city. The City Council’s Public Works Committee on Monday recommended approval of the resolution, but councilors said the idea is not intended to pave the way for Gaia Gardens, which is working to resolve city code violations identified earlier this summer. “I don’t have a problem supporting local agriculture, but what I don’t want to do is reward bad behavior,” said Councilor Chris Calvert. Gaia Gardens had already stopped selling produce from a farm stand along the Arroyo de los Chamisos when it received a letter in June that also ordered operators to stop hosting school groups and other volunteer helpers. One of the six alleged code violations had to do with makeshift housing that property owner Stuart Jay Tallmon put up on the land without a permit. The city also found that the nonprofit garden founded by farmers Poki Piottin and Dominique Pozo was operating without a business license. The pair have since applied for a home occupation license that, if approved, would allow them to grow and harvest vegetables on the property and sell them at another location. The license also would restrict the number of workers at the garden to two at a time. City Land Use Department Director Matthew O’Reilly said the application is under review and Piottin is acting as the landowner’s agent to address building code violations in some structures on the 3.5-acre property. Councilor Patti Bushee, who sponsored the resolution before the City Council, stressed Wednesday that it isn’t really about Gaia Gardens. She said it’s more about the kind of issues it has raised. “They are sort of a bad example of something well-intentioned that went too far,” she said, noting that she’s not proposing immediate code changes, but rather an examination of broader issues. Bushee’s proposal also asks staff to consider how the city can allow farm stands to sell produce near community gardens in public spaces. The city and county Advisory Council on Food Policy is already working on recommendations to help the region move toward more local food production and consumption, said Katherine Mortimer, the program manager for the city’s sustainability plan. She said the extra direction from the council on urban agriculture would be timely. “The Food Policy Council has been talking about wanting to promote urban agriculture long before the concerns with Gaia Gardens were present,” she said. Piottin said he believes Santa Fe should focus on creating a section in the land use code to explicitly welcome food production in the city. Other cities have taken steps that make it easier for urban farming, he said. “It’s doable. It just has to be on the books, otherwise our operation has to fit within the terms of the home occupation license, which is not made for farms,” he said. Even if such changes get made in the long term, Gaia Gardens might already be over, he said. “We are a nonprofit with an educational mission, so if we can’t have schools, we are closing up shop,” he said. Area residents who say the garden has not been a good neighbor have raised the issue with the City Council on several occasions. The city also has received dozens of letters from people who live nearby and support the farm. O’Reilly said city staff believe there’s a way to help the nonprofit understand the city code and operate within it, noting that the biggest violations have to do with substandard housing and plumbing as well as grading for the garden that took place without a permit. Another big concern, he said, is the amount of car traffic that the operations generated. Councilor Ron Trujillo said he hopes city staff will consider the history of the area. Gaia Gardens is in his district and he’s heard an earful from constituents. But he noted that the main artery through Bellemah is Rancho Siringo. “There’s a reason it’s called Rancho Siringo. There used to be ranches and agriculture there,” he said. There has been a lot of recent buzz related to farming in metro areas. While there always are multiple aspects to consider, making the most of urban farms and gardens provides the opportunity to bring together a broad spectrum of fields — including health, urban planning, transportation, education, environment, food and sustainable agriculture, and economic development — in creating healthy communities. As a nonprofit organization devoted to promoting locally based agriculture, Farm to Table’s programs strive for equity in our food system. As such, we consider city-based farms and gardens exceptional venues in reducing the disconnect that happens when the only food consumed is store-bought. Regardless of income level, urban farms and gardens enhance our quality of life. They can improve community nutrition and physical activity, maintain cultural traditions and help enhance food security by providing opportunities for community-members from all income-levels to grow or purchase local fresh produce. Low-income communities, where fresh produce is often hard to find and expensive, greatly benefit by having nearby urban farms and gardens that provide access to healthy options, which otherwise are not available. As an entrepreneurship venture, urban farming can be an economic development option that, while requiring regulation to ensure multi-zone neighborhoods work well together, has benefits that surpass a routine business transaction. Beyond increasing the accessibility of local fresh produce, urban farms and gardens build local leadership, have the involvement of volunteers and community partners, and include skill-and-awareness-building opportunities for community members of all ages and interests. Likewise, Farm to Table supports engaging children in gardens and agricultural-related activities that help develop the understanding of the interdependence of all living things. Many educational goals can be addressed through gardens, including personal and social responsibility, such as how to be a good neighbor and how to care for a livable environment. Gardens and agriculture integrate several subjects, such as science, math, art, health and physical education, with social studies, storytelling, creativity, visioning and play. We hope Santa Feans share Farm to Table’s support of urban farming and gardens, and, as such, embrace livable spaces that add options and access to healthy foods in our community. Visit us at www.farmtotablenm.org to learn about all of our programs. Nelsy Dominguez is the deputy director of Farm to Table. City inspectors found a host of violations at the property that hosts Gaia Gardens off the Arroyo de los Chamisos Trail, but progress is being made to correct every one, according to city Land Use Director Matthew O’Reilly. But that doesn’t mean the urban farm is out of hot water. A water use complaint is pending with the Office of the State Engineer, and farm founder Poki Piottin said he still faces a series of obstacles before he can run the property in a way that would match his vision. Two issues are at work here. One relates to structures and rental units on the property, which is owned by Stuart Jay Tallmon, who lives in Colorado. The other relates to the appropriate type of activity at a large garden there, created by Piottin, whose produce is sold at the Farmers Market and used to be sold at the garden. Other violations concerned shed construction, plumbing and electrical installations, and other renovations that were done at several buildings, including rental units, on the property without required permits. Others involved things such as improper venting for a water heater and dryer, lack of safety railings on stairs, lack of ground fault circuit interruption on electrical receptacles, and more. One issue affecting the garden concerned the need for erosion controls in an area that was graded. But Piottin, who said he was turned down the first time, is trying again to get a home occupation license that will allow him to operate the farm in a residential area. And even if his second try is successful, such a license “is very restrictive about how many people we can have visiting and have working” in the garden, he said. His website tells volunteers that he can currently have only two people at a time helping out in the garden. It also shows photos of a July 1 community potluck with about three small tables of visitors. “We want to have three groups of five kids each week, during certain hours,” Piottin said of approvals he’s seeking. But Piottin, who said he wants to be able to serve an educational function, showing groups how to create such a garden in urban spaces, is wrestling with how to have such visitors allowed. Applying for rezoning or a special use permit could be very costly, and likely would encounter some community opposition, he said. Piottin said he is also faced with a complaint to the Office of the State Engineer about using a domestic well for commercial purposes and is also in the process of declaring water rights on a second well on the land. “If we don’t get an extension from the Office of the State Engineer, or succeed at obtaining a declaration of agricultural water rights, we will have to stop selling our produce by August 12 (as per order from the Office of the State Engineer),” he wrote in an email. Susan Turner, who lists a Llano Street address and filed the initial complaint against the property with the city Land Use Department in February, as recently as June 19 had sent photos to O’Reilly of Piottin giving a garden tour to “fifteen people, mostly children.” She also submitted a log of six days in June during which from four to nine people were working in the garden. Turner did not return a call from the Journal on Wednesday. She alleged Tallmon placed a manufactured dwelling on the property “several years ago” that was used as a school and later as a summer camp for more than 25 children. People in the community expressed their concerns about it at the time, she wrote in her complaint. Grading done in 2011, she wrote, altered the watershed and led to flooding of the foundation and crawl space of an adjacent home. With Gaia Gardens, produce selling from a stand on the property (since discontinued) and the size of the agricultural production are prohibited in residential zones, she wrote, adding that the scale of the work would exceed even a home occupation license. She referred to people picking crops early in the morning and after dark, sometimes with car lights shining on the garden. She also referred to vehicles parked on both sides of the street; stacks of equipment, debris and lumber on the property; individuals camping on the property and portable toilets brought in; vegetables growing and “shrines” created outside the property lines. “This property continues to be an ‘eye-sore,’ and a possible health hazard,” she wrote, complaining of a degradation of property values and quality of life for nearby residents. “We were subjected … to the noxious smell of twenty plus tons of manure being spread over the property, loud speakers playing music at high volume, an audibly engine running a manure tea machine in operation all night, debris from the stirring of dust and dirt” and more, she wrote. She also submitted a log of six days in June during which from four to nine people were working in the garden. What a pathetic dichotomy! In the same week that city code and zoning inspectors visited Gaia Gardens, the state of New Mexico was graded dead last — not our usual rank of 49 or 48 — in general child welfare. Gaia Gardens, an organic farm on the city’s south side, sprang into being last year from the vision and hard labor of Poki Piottin and Dominique Pozo. When I first visited the garden last summer, I was astounded at the miraculous change that had occurred on that portion of Santa Fe’s arid landscape. Six-foot tall sunflowers swayed in the breeze above rows of green arugula and chard. A little farm stand provided a chance for local folk to purchase organic vegetables. Later on I learned about composting and soil preparation through workshops at the gardens, and met like-minded folks at potlucks. These activities were quietly conducted with no increased noise or traffic in my residential neighborhood. Personally, I never go to the Santa Fe Farmers Market. I don’t like the drive and don’t want to mess with parking downtown. However, last year it was possible to walk over and purchase vegetables from the farm stand. Economic opportunities? Alternatives to automobiles? Sustainable development? Livable neighborhoods? Gaia Gardens actualizes this vision, and much more. Gaia Gardens fosters educational opportunity and a true sense of community. Visiting classes from small schools and students from nearby Santa Fe High School, as well as adult volunteers, have had the opportunity to get their hands dirty, shovel compost, watch baby ducklings and eat carrots fresh from Mother Earth. I worked in the Santa Fe Schools for 25 years. Sadly, many children I worked with thought food only came from MacDonald’s — not Old MacDonald’s farm. 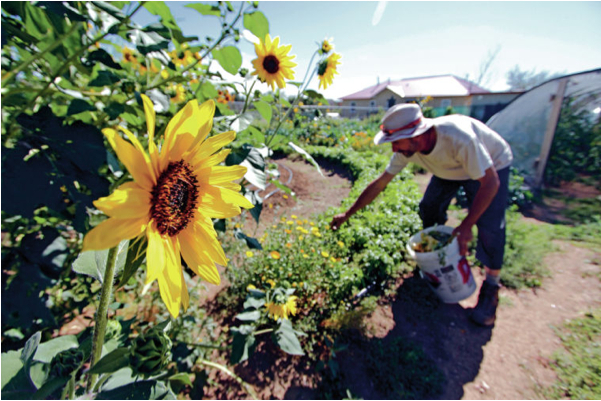 The Sustainable Santa Fe Plan has a large section devoted to food systems. Stated goals include creating multiple food growing, processing, storing and selling opportunities. Other goals include identifying and reducing barriers to urban agriculture, developing neighborhood centers for home economics, sustainability, food-related processes and providing educational resources for organic food production. Both the vision and the actuality of Gaia Gardens support these goals. Communities spring up organically, but they need nurturing. It was my experience working in the schools that well meaning attempts to implement a sense of community from the top down were rarely successful. Yet other schools had a strong sense of shared vision and were wonderful learning communities. What made the difference — what really worked — was a magical coming together of opportunity, leadership, and willing participation. Like the tender shoot of a plant, an emerging community can grow and bloom under favorable conditions or can die from lack of nourishment. I urge the City Council to do whatever necessary to allow Gaia Gardens to thrive. 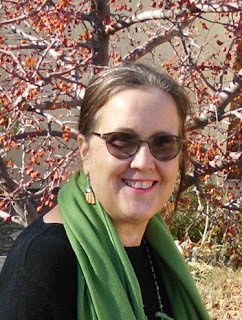 Susan McDuffie retired from the Santa Fe Schools in 2007. She now writes historical mysteries and enjoys growing a few vegetables at home. Some days, you just don’t know whether to laugh or cry. On the glad side, Santa Fe’s city land use department appears to be taking enforcement of the zoning code seriously. The bad side? The department has all but shut down a thriving urban farm in the process. Gaia Gardens got started at the back of a lot on Santa Fe’s southside last year. The little farm operates with volunteer labor, and with a sideline produce stand patronized by neighbors and walkers along the neighboring Arroyo Chamiso Trail. Movie nights, educational sojourns for kids, a monthly neighborhood potluck – Gaia Gardens was a happening place. Then, in January, one of the neighbors complained. In four visits over the ensuing months, city inspectors found all sorts of violations of the city code, ranging from unpermitted structures to an RV that was being used as living space. More problematically, the little farm drew crowds – or, as the city put it, more visitors were coming to the property than would normally be expected at a residence. And that produce stand was not an approved land use in a residential district. So, Poki Piottin’s vision of a sustainable communal garden plot is on hold, at least until city inspectors issue a written report next week. Clearly at least one of his neighbors hasn’t appreciated his efforts. But other neighbors point out that Piottin has cleaned up a property that was otherwise something of an eyesore. Plus, his garden with its rows of green growing food crops is a pleasure to behold. The city shouldn’t be criticized for cracking down on unpermitted structures, people living in RVs, or other significant violations of the residential zoning code. On the other hand, Piottin seems to be doing more good than harm with his little farm. And surely some of his infractions are easy to correct – he could stop selling produce on site, for example, and just take the veggies to the farmers market. Better coordination among his volunteers might eliminate the traffic problem. In short, there’s room for maneuver here. Both the city and Piottin should get together and work out a way for the little farm to stay. Poki Piottin’s dream of creating community and spreading the gospel of home-grown veggies on urban plots has run smack into Santa Fe’s building and land use codes. 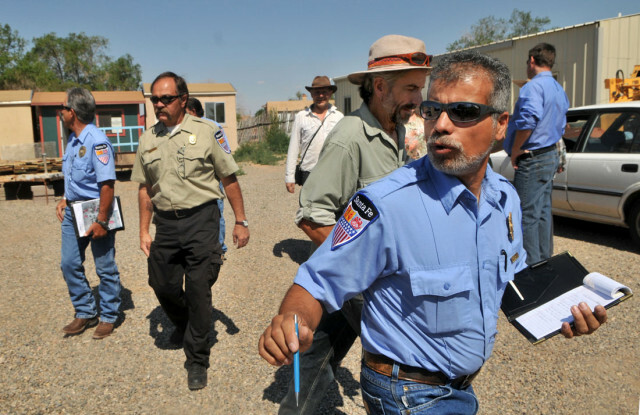 Five inspectors toured the property Thursday, taking pictures and notes, leaving the future of Piottin’s Gaia Gardens along the Arroyo de los Chamisos Trail up in the air. “Basically, we are being prevented from operating as a nonprofit. We grossed $12,000 last year and spent $10,000 (on improving the property),” said Piottin, who explained that ongoing city inspections, which began in February or March, resulted in six citations. This was his fourth inspection, he said. But Mike Purdy, director of inspections and enforcement in the Land Use Division, told Piottin and some of his supporters Thursday that the city was responding to a complaint and was trying to apply the codes equally to everyone.